Sometimes you need a bow that is incredibly fast and powerful when you are hunting large game, and the Excalibur Matrix Mega 405 might be exactly what you are looking for. It features a sturdy construction that is well balanced and its smooth performance ensures accurate shots. It should be noted that this recurve bow is designed for experienced hunters, and its powerful design might be more than novice archers can safely handle. One of the most important aspects to consider is the crossbow’s build. You want it to come with a sturdy construction that is also lightweight for easy handling. Lighter crossbows are also easier to carry to a hunting blind, and can help prevent arm fatigue that might cause your hands to wobble during the shot. The Matrix Mega 405 features the durable build that Excalibur is well known for. The sturdy limbs ensure plenty of stability for the heavy draw, and the riser attaches easily for added support. The lightweight materials make the bow relatively easy to handle, though the Matrix Mega 405 is slightly heavier than many similar models. While this does ensure that the bow is built to last, it does make it difficult for some archers to maneuver comfortably. Excalibur is known for its well designed crossbows, and this recurve model is no exception. The sleek design gives the bow a stylish appearance, and you will appreciate the “mossy oak” pattern on the limbs and stock when you are trying to remain hidden in the blind. The crossbow is also designed to be nearly silent when fired, which is always an advantage when you are stalking your prey. The designers at Excalibur are also concerned with safety, and with a maximum speed of 405 feet per second and draw weight of 290 pounds this is an important consideration. Since the heavy draw is difficult to safely pull without straining a muscle, the crossbow is designed with a convenient rope cocking device. While the 14 inch power stroke still requires plenty of stamina to draw the string tightly, the added cocking mechanism can make it significantly easier. The bow also comes with an anti dry firing device which prevents potentially dangerous and damaging misfires. There really isn’t another recurve crossbow to compare the Matrix Mega 405 when it comes to matching speed, power and performance. The bow is capable of a maximum velocity up to 405 feet per second, backed by an impressively heavy 290 pound draw weight. When the potential kinetic energy is factored in, you can easily take this crossbow with you on almost any hunting trip. Along with its speed and power, this bow is also capable of providing you with a smooth and accurate performance. The included scope makes it easy to accurately line up with your target, and it can be adjusted to group your shots. The bow also comes with built in dampeners on the string to ensure an ultra quiet performance. This is always an advantage when you are trying to creep up on your prey. This convenient crossbow kit includes everything an experienced hunter needs to set out on the next trip. The accurate scope makes it easy to zoom in on a potential target, and its durable construction will hold steady at “zero” through most bumps and falls. The string dampeners ensure a quiet draw and release that is always appreciate when you are hunting easily startled prey. You also have the advantage of the release mechanism built into the bow, which lets you uncock arrows without having to fire. The included quiver makes it easy to keep everything close at hand in the blind, and the rope cocking device ensures that you can tightly draw the bow string. With four Diablo and field tip arrows included with the kit, you can start practicing your shots as soon as the crossbow is assembled. The clearly written instructions will walk you through the simple set up steps, and with everything included you can have the crossbow assembled in minutes. 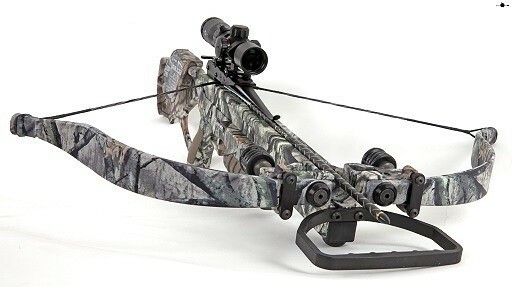 While this recurve crossbow from Excalibur is not designed for everyone, it is extremely fast, powerful and accurate. Weighing 6.2 pounds and 36.2 inches in length it is a little longer and heavier than similar recurve bows, but this is necessary to support the 290 pound draw weight. Capable of a maximum velocity of 405 feet per second and backed by 290 pounds, this recurve bow can easily take out almost any type of target. With string dampeners to eliminate external noise and the “mossy oak” camouflage design you can easily remain hidden in a blind without worrying about startling any prey. Perfect for avid hunters who need a fast and powerful crossbow, you will be able to effectively take down almost anything with the Matrix Mega 405. This recurve bow is fast, powerful, and quiet, which makes it the ideal choice for experienced hunters. Everything you need to start hunting large and small game animals is included with the Matrix Mega 405 crossbow kit. You will appreciate the included safety features, along with the rope cocking mechanism that makes it possible to pull the 290 draw weight. The only mention regarding this recurve crossbow from Excalibur is its slightly longer length, and its draw rate that might be too heavy for everyone to comfortably pull.